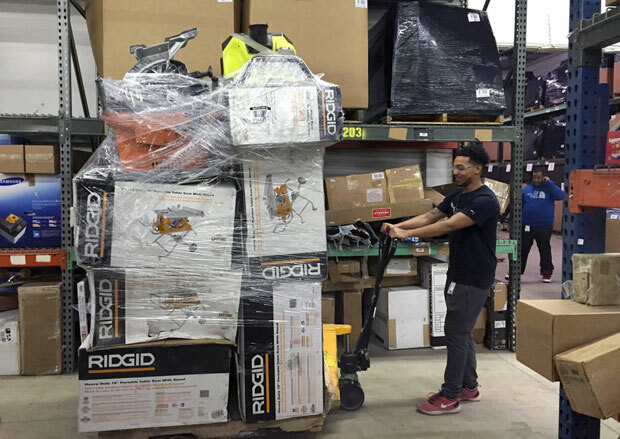 Employee Marvin Whitehead scans returned items so they can be resold at the Optoro warehouse in Lanham, Md. An employee drags a palette of recently returned goods through the Optoro warehouse so they can be processed. We change our minds about purchases a lot in the U.S., especially after the buying binge of the holidays. Returns cost retailers about $260 billion each year. That doesn&apos;t include the cost to the environment of all that producing, shipping, and throwing away. One of the companies on the receiving end of all those returns is trying to reduce the cost to retailers, and the cost to the environment. The Optoro warehouse in Maryland is a hoarder&apos;s dream — the building is packed, floor to ceiling, with returned merchandise. The CEO, Tobin Moore, stands neck deep in stuff that people changed their minds about. "This is probably 10 truckloads just right here — air compressors, power drills, lawn mower I think, carseat down on the bottom," Moore says. You might think that when you return something, it goes back on the shelf. But it&apos;s often too much hassle for the stores to sort and restock. Returns might go to liquidators or resellers, or straight to the landfill. Optoro is trying to change that, with something called "reverse logistics." "The real goal of reverse logistics is to try to get the products as fast as possible with the least amount of touches back to market — whether that market is being sold online, to a wholesaler, to a recyclers, or donated if it should be sent to a charity," Moore says. The workers here, about 150 of them, pick through every little thing in these stacks, and decide where the stuff goes next. "There&apos;s some things you can put thru in a few seconds, especially if it&apos;s a new, unopened box," says worker Greg Cull. Other things, Cull says, need testing. He&apos;s sitting at a workbench, styrofoam packaging littering the floor, checking out a sleek, new speaker system. Cull spends his day testing electronics like this. These speakers seem fine, so he sends a song thru the cables. "I haven&apos;t checked the subwoofer yet," he says. "Yeah, it&apos;s working." Sounds good, all the parts are there, it looks untouched. This will go on the website blinq.com, at a fraction of the price. Products that are dented or don&apos;t have original packaging go into big bins on the loading dock — off to pawn shops or mom and pop stores. Another worker, Gleason Wood, points to one pallet, a hodgepodge of hundreds of things. "That pallet right there we&apos;re asking for $1,835 for it," he says. The stuff on it sold for five times that much. "A couple of tools, a juice extractor. Me, myself, if I had a flea market I would want it," Wood says. Optoro has found a niche sorting returns, and the river of rejects is expected to keep growing as more stores offer free shipping both ways. Tobin Moore is benefitting from America&apos;s obsession with stuff. It also makes him uneasy. "Both how we consume and how retailers are dealing with returns isn&apos;t really sustainable," he says. The folks at Optoro will take in and send out 25 million items this year — more than double the number from last year.